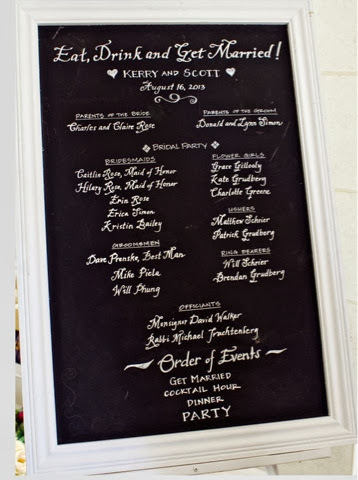 the search for the perfect chalkboard for my daughter's wedding! 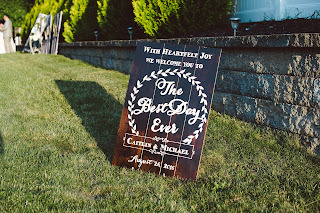 I told you about my dilemma with the large ornate frame I bought at Goodwill which was going to make the perfect chalkboard for my daughter's wedding- I painted it and let it dry outside only to have it crumble in a flash rain storm! Oh, the trials of a DIY'er!! I found the perfect specimen, once again, at my fave GW outlet and it was attached to a canvas picture- maybe I'll have less work this time? Or, maybe not! A lovely beach scene with a broken fence! I wiped it down thoroughly, removing dirt and cobwebs accumulated over the years. My spray painting with chalkboard paint gets out of control! And perfect for the wedding! My uber talented sister used her amazing skills to create exactly what my daughter wanted! It was a work of art- thanks again Ellen! !